Play to Your Health's Elementary School Enrichment Classes are the perfect addition to your After-school Offering, or Physical Education Program! Play to Your Health stays up to date with the latest equipment, activities, and coaching strategies, inspiring Original Class Content that moves innovation forward! 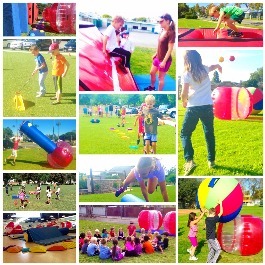 Each class brings new games, mind & body challenges, pre-gymnastics, obstacle courses, and sports. From Kindergarten to 5th grade, students can look forward to a fresh class that inspires! Play to Your Health takes MOBILE CLASSES to new heights, by bringing more equipment than any other program. In 15 minutes or less our instructors transform empty space into a play paradise. ​Our innovative transportation, set up and take down methods is our secret to providing more for less! ​​For the last 5 years, Play to Your Health has been working with schools to provide our unique and comprehensive physical education enrichment classes. We take tremendous pride on our long lasting partnerships with these schools, and credit our school first approach to making this possible. It is our privilege to teach in your school, and we honor that, by providing only the highest quality Physical Education Classes. Our coaches arrive on time, with more equipment than any other mobile program, and ready to exceed student, teacher, and parent expectations.